TaskJuggler (http://www.taskjuggler.org )a really nice and well presented interface. The best part is that it is Open Source and you save from having to pay huge license fee for products like MSP. 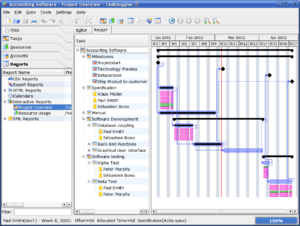 A good tool for project managers and it not only supports gantt charts, but cost management and what-if scenerios. It is a modern and powerful project management tool with a new approach to project planning and tracking beyond what commonly used Gantt chart editing tools. It covers the complete spectrum of project management tasks from the first idea to the completion of the project. It assists you during project scoping, resource assignment, cost and revenue planing, risk and communication management. You also have the options of doing your own coding and it comes with exporting to CSV files. Thanks for this site. This is my first visit, but probably not the last. I found you looking for project mangament software in Wikipedia. BTW, you have a typo in the link to Taskjuggler above (an extra parenthesis).